This is a continued post from my previous post here. Pros: Similar to events tool, there are a lot of options that you can choose to build a segment and analyze the data so it is good. Also, once you created a segment, you can click on it and it will show the report and you can reuse it any time. Cons: There are no default segments so you have to define everything on your own since from the start so it is a bit of manual work. Everybody loves funnels right? It is the most effective data visualization on user flow and Heap’s funnel report doesn’t disappoint either. Pros: You can construct goal funnels in Heap anyhow you want. Yes! anyhow you want! That means you can combine events and pageviews together to construct funnels which can be very powerful to understand what users are doing on your site. For example, if you look at my report below, I am constructing goal funnels for user journey where the users first visited my homepage, click on Header – About Me, and then proceeded to View About Me page. 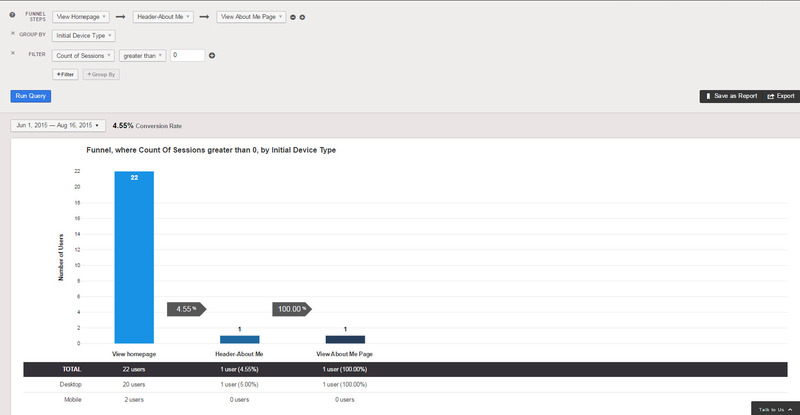 You can also group your funnel reports, like I did with initial device type and also you can implement filters as well. This is the best feature I can think of related to Heap Analytics. Cons: Might take you some time to get used to it as you need to understand how events and pageviews are defined in Heap Analytics related to your site but once you get a hang of it, it becomes pretty easy. If you have used other Analytics tools such as GA or Adobe before, you will see that they give Aggregated reports on how the users move through page to page. In Heap, it is based on users level so it can give you detailed reports of how individual users move through. This is what you can found under List reports. Pros: The first time, I saw this report, I am like “wow, this is crazy!”. Because as you can see from above, Heap gives you the flow of every user not Aggregated reports. So you can clearly see how they come from, their location, browser, device type and what they are doing on their site. Above report is how the users interact with my site since with their time stamps. Plus, you can also add filters to this report, which means you can filter out users with similar behavior and analyze. The below is my filtered report of users who has clicked on About Me button and viewed About Me page at any time. This is where you can build graphs related to your reports. As I mentioned, there are no predefined reports in Heap unlike other Analytics tools so you have to build everything on your own. Pros: Pretty self-explanatory and easy to use. Cons: There is not a lot of options, you can only choose to display data in either line or table format, so there is no pie chart etc. Will be good if I can get more options. Retention is one of the most powerful analysis that you can done on Heap. You can use this to do Cohort Analysis- an analysis to understand users who all share similar characteristics. For example, the below is retention analysis of my site for users who have first visited homepage and then returns to view About Me page. As you can see, 33.33% of people who has visited my home page during July 13- 19, 2015 period came back and visited About Me page. Pros: It is very powerful tool especially if you are using Heap to track your app. You can do retention analysis of users who first installed the app and then start a game (or) do the action that you want them to do. And then based on that you can understand how each cohor behaves. Cons: Similar to other reports, you will need to know first what you want to do to use this otherwise it can be confusing for you. My suggestion is to define events or segments first and then use this. So this is it! This is my review of using Heap Analytics for the past few weeks. My verdict is it is simple tool and very customizable based on your requirements so if you don’t want to use other Analytics tools with lots of reports that may not be useful for you, this is the tool for you. And it is very easy to implement and comes with affordable pricing as well. I can see myself using this tool for both website and app tracking, especially latter because it is very easy to implement and analyze using Heap for apps (currently only supports iOS apps).